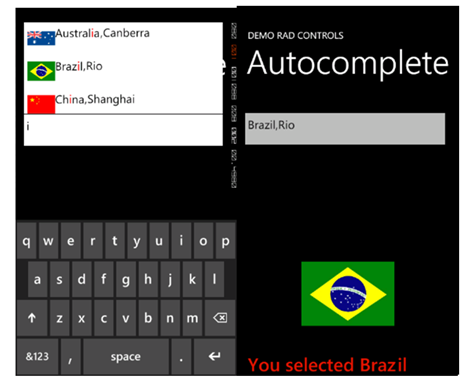 RadAutoCompleteBox control provides suggestion to user. It provides suggestion on basis of set criteria filtering data from a SuggestionSource. SuggestionSource is nothing but a Data Source. RadAutoCompleteBox control gives you immersive experience as following. It can be bind to data source as simple as collection of strings or collection of complex objects. In below RadAutoCompleteBox SuggestionSource is of complex objects. To start working with RadAutoCompleteBox first you need to add following namespace on the XAML page. There are many properties exposed to configure RadAutoCompleteBox. You can set values of those properties as per your requirement. Two important properties are AutoCompleteMode and AutoCompletePopupDisplayMode. 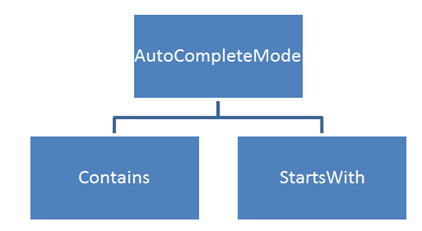 AutoCompleteMode property defines the way filtering should be done. Filtering criteria will be can be set to two values. SuggestionSource can be created as following. It is a function returning List of Strings. After creating SuggestionSource you can set that in code behind as given below. Now let us see how we can work with a complex object. 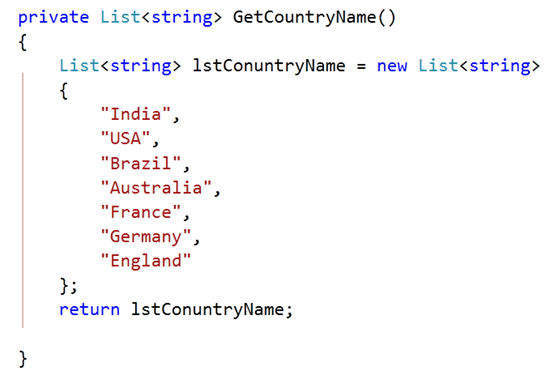 For that go ahead and create a class called CountryData. There are three properties in the class. Next you need to create data source or suggestion source. For that I have created a function returning List of CountryData. I have put images in the Images folder. In below function using collection initializer we are creating List of object of CountryData and returning that. GetImageSource function is defined as following. This function is taking image path as string and converting that to ImageSource such that directly can be bind to Image control. Now you need to put radAutoCompleteBox on xaml. We are filtering on a SuggestionSource consist of complex objects so you need to set the value of property FilterKeyPath. You can set value of this property to any property of the object. In this case we are filtering on CountryName. SuggestionSelected event gets fired when user selects an item from the popup. By now you have created radAutoCompleteBox and bind to a SuggestionSource of complex objects. Next we need to create SuggestionTemplate. SuggetionTemplate defines the way data from complex object bind as SuggestionSource will be displayed in the suggestion popup. Since there are three properties in the object and one of them is an image. So simply we have put a StackPanel with horizontal orientation and binding properties value in controls inside the StackPanel. Last but not least we want items highlighting on filtering. We want to highlight item on property set as FilterKeyPath. We set CountryName as FilterKeyPath. You can highlight item on filtering as following. You can set highlight style on background or foreground. Consolidating codes from above discussion you will have XAML as following. There is one StackPanel in second row of Grid. On selection of an item, that item will get displayed in controls inside StackPanel. Last but not least you need to handle SuggestionSelected event. In this event we will bind selected item in controls inside StackPanel. In this way you can work with radAutoCompleteBox. I hope you find this post useful. Thanks for reading.